The table was easy to put together but surprisingly light weight. I bought it for next to my grill for holding trays and grilling supplies. I added a couple of "S" hooks to the front and hung my spatula and grill scraper from them. It will work. 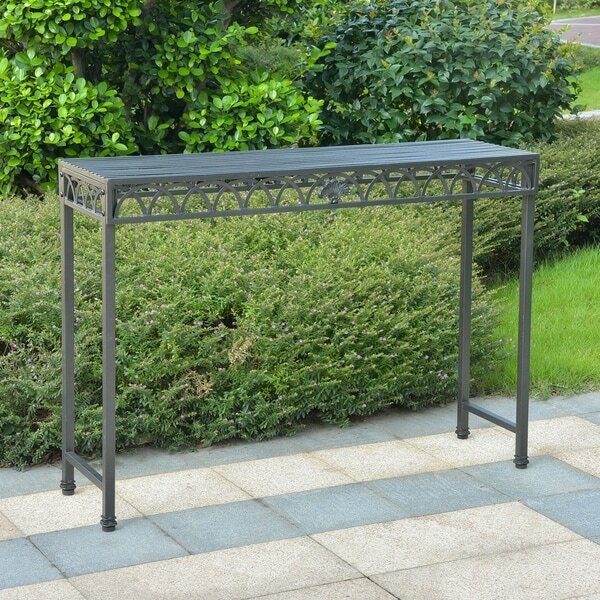 The Segovia indoor/outdoor console table will absolutely enhance the look of your home from top to bottom and is designed with extremely durable iron legs for maximum stability. It is has a beautiful powder coated antique black finish for a natural contemporary indoor or outdoor look. Works great for sunrooms, hallways and patio areas. Designed with an alluring antique black contemporary finish. Dimensions 14.0 In. X 47.0 In. X 34.0 In. Fit perfectly on our patio - exactly what I needed! 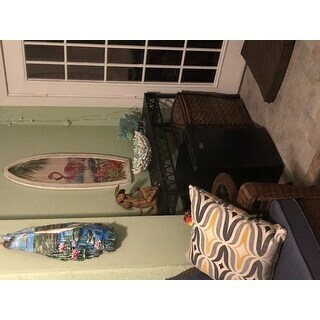 We needed the height to reach over a small refrigerator and width to not obstruct the foor - this for the bill and matched nicely with everything. I love the simple design. I thought I would need to paint to match my patio and yet it does not look so black as described. It has more of a "dark brown" look. Just what I wanted. Perfect addition on our pool deck. It's sturdy, yet looks effortless and unobtrusive. Will be a good surface for buffets, drinks and lighting. Would recommend. Seems well constructed. Easy to assemble. Finish is very good. Well made. Stylish. Sturdy. Just what I was looking for. Love this table. It fits perfectly in the place I ordered it for. Was easy to put together, sturdy and a nice color. I'd buy another one if I had the space. We got one to see how it would fit next to our hot tub, it fits perfect. My husband said to get two more for the other sides. "How much does this weigh and will it hold heavier items like a crockpot and trays of food?" Good style, size and function for my porch. Safavieh Outdoor Living Rustic Annalise Rustic Brown Iron Accent Table - 35.5" x 18.5" x 29.3"